Emmanuel Cephas wonders whether all the children – especially African-American males – labeled as having attention deficit hyperactivity disorder are actually sick. Or could something else explain why a child shouts out answers or has trouble sitting still at a desk all day long? Cephas recalls his own experience in the Baltimore City Public Schools – “how bored and frustrated I was in math class.” Even today, when he’s working out a difficult technical problem, he’ll start pacing the floor. According to Cephas, many people have what’s known as a kinesthetic learning style: they do better when their bodies as well as their minds are engaged and active. All kids start off learning this way, but when grade school arrives suddenly everyone has to sit down and be quiet for hours at a time. Cephas believes many people just can’t learn that way, and the solution seems obvious to him: If movement helps kids to learn, incorporate movement into lesson plans – and design software to bring those lessons to life. At the heart of Cephas’ innovation is gesture-recognition technology like that used in the Nintendo Wii or the Xbox Kinect, in which the computer responds directly to a person’s movement without need for a mouse or keyboard. In the classroom version of the program (there would also be a version for home learners), kids would be on their feet, watching a screen on which colorful objects respond to them waving their hands in certain ways. The object on the screen would represent a math equation, for example, and the students’ hand movements would correspond to the steps required for solving it. The North Baltimore resident says there is solid science to back the kinesthetic learning model. Research at the University of Chicago and University of Miami shows that incorporating kinesthetic elements into nonmotor tasks or even practicing Asian movement arts like tai chi can enhance learning in surprising ways. Cephas, 31, says he was a fairly average student until 11th grade, when he discovered astronomy and learned that “there are mathematical equations that describe the physical world, and we are bound by them. Learning that was deep for me.” From that moment, he was hooked on math and science. For Cephas – who changed his major from art to computer science at Frostburg State and also has a degree in physics from College Park – using hand movements to help solve math equations is just the start. The former NASA programmer is working full-time to get this venture off the ground, and he has big plans for it. 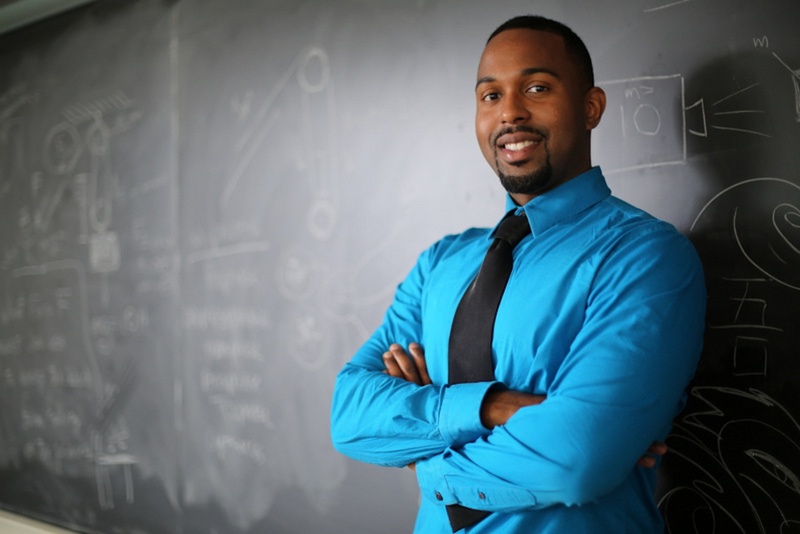 He thinks what he doing could ultimately revolutionize education in America. “This is a rebellion,” he says. “This technology I see as a foundation for other technologies that will incrementally, over time, begin to change how we learn and teach in our lifetime.” And Cephas wants to be clear that what he is designing is not intended just for African-American males. “This benefits everyone,” he says.